A castle-like structure with a complicated history, the Tower has served as both a royal residence and a place of frightening torture. It housed William the Conqueror and Edward "Longshanks" I, held prisoner the infamous "Bloody" Mary I, Guy Fawkes and the deputy leader of the Nazi Party, and remains the home of the fabled Crown Jewels. In a new series from The Royal Mint, the Tower of London is being honored with four distinct designs, including the world-famous Beefeaters and the Crown Jewels themselves. In addition, each design displaying a single section of the Tower's outer wall. Collect all four, and the complete walls of the Tower of London are revealed! Through dark times and light, one thing has remained constant: the ever-watchful eye of the official Guardians of the Tower—the Ravens. Legend states that if all six of the Tower Ravens depart, the Tower of London will fall. Just in case, the Tower's ravenmaster keeps a seventh bird as backup! 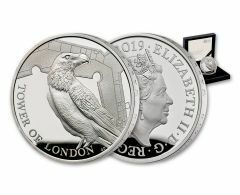 The first release of the Tower of London series, The Raven is available in both silver and gold. Each legal-tender "coin of the realm" comes struck in shimmering Proof condition—the epitome of the minter's art. Which it would have to be—after all, the Tower of London is also the location of the very first Royal Mint, installed by Edward I in 1279! 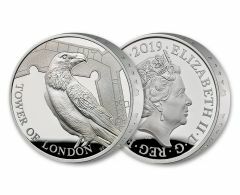 The Silver Tower of London Ravens Proof is available struck as a double-thick Piedfort, allowing the design to sit even higher off the concave surface. 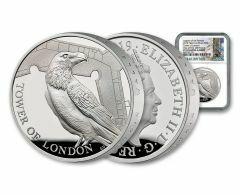 The Piedfort and the £5 gold are also unique in this year's release in that they display edge lettering, which reads "On into twilight within walls of stone," a line from the poem "Human Life" by Samuel Rogers. 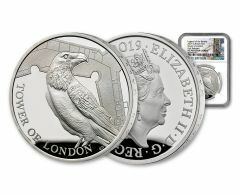 Numismatic Guaranty Corporation (NGC) and the Royal Mint have certified a small number of Silver and Gold Tower of London Ravens Proofs as First Releases. 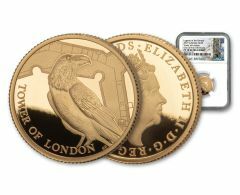 Once certified and graded, each coin is then sealed in a protective display holder with an exclusive Tower Bridge NGC label. 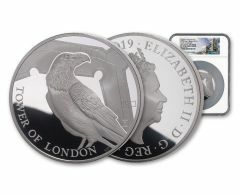 Each Silver or Gold Tower of London Ravens Proof has a strictly limited mintage. Only a small number of each come certified by NGC as First Releases. 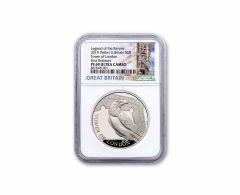 As First Release pieces of the first entry in a new series from the Royal Mint, these coins won't last long in our vault!